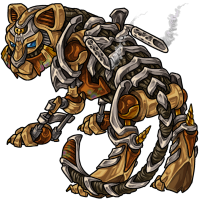 Larry the Steamwork Tigrean has won the Pet Spotlight! Awesome profile! I loved how the ship name worked out as pet owner. Super spiffy! Very well done. Love the art work and the story. Congrats! Love the art and profile. Awesome pet, love the story and beautiful profile. Congrats Larry and Chii. Awesome pet, congrats on the win!